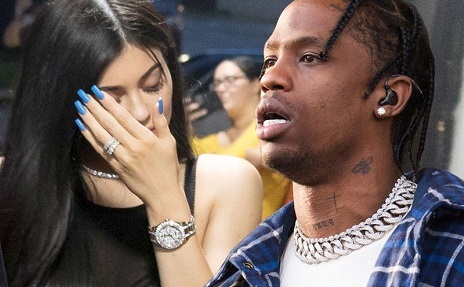 Earlier this month, it was claimed that Kylie Jenner had been dumped by rapper boyfriend Travis Scott just days after the pair were photographed together at Kris Jenner's Christmas Eve party. And now insiders claim pregnant Kylie had a bitter showdown with her ex at mum Kris’ LA house, accusing him of cheating on her with multiple women. The insider adds that Travis is doing all he can to win Kylie back and has been sending her flowers and gifts to prove how sorry he is. But an emotional Kylie has reportedly told him to ‘leave her alone’ and only wants the support of mum Kris and best friend Jordyn Woods. Despite shying away from the spotlight since rumours of her pregnancy first swirled in September, insiders recently claimed Kylie was gearing up for a big return to social media. According to insiders, the 20-year-old will introduce her newborn baby as part of a well-timed comeback that conveniently coincides with a re-brand. The reality TV star will maximise its impact, too, by announcing the tot's birth online. A source told Entertainment Tonight : “As soon as the baby is born, she will make an announcement and introduce the baby to her fans. "She’s excited to continue to be her authentic self, and that will soon mean being a mother and sharing that with her fans."